Your little guy is bound to get dirty while you're out. These reversible pants, by Hatley, made of soft bonded cotton will rescue you. Choose which side he'll wear: roaming moose on one side or buffalo plaid on the other. Either way, he'll be cute as a button. Full of design details and construction. Bonded reversible pants with contrast leg opening cuffs. Elastic channel waistband. Seams are finished with flatlock for reversible wear. 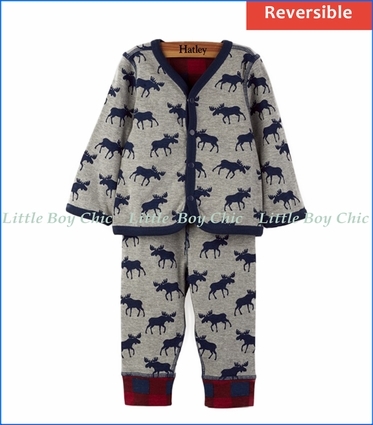 Pair with Hatley's matching Reversible Roaming Moose & Plaid Cardigan.